MSC Cruises took delivery of their newest ship, the MSC Fantasia, at a ceremony on Wednesday at STX’s shipyard in St. Nazaire, France. Four-year-old Asia Aponte, granddaughter of the line’s owner Gianluigi Aponte, was the symbolic godmother of the ceremony held at the shipyard, where MSC’s flag was raised on the vessel. MSC CEO Pierfrancesco Vago and Jacques Hardelay, general manager of the shipyard, attended the ceremony. The 133,500-ton, 3,959-passenger Fantasia is the largest ship in MSC’s fleet and the sixth new-build built by STX France for MSC. 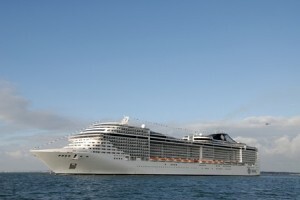 The MSC Splendida, sister ship to the Fantasia, is scheduled to join the fleet in July 2009. Following the flag-raising ceremony, the ship sailed a chartered cruise to Naples, Italy, stopping at Lisbon, Gibraltar, Alicante, Barcelona and Marseilles. The ship will be named in Naples on Dec. 18, by godmother Sophia Loren. Fantasia will then sail its official maiden cruise before relocating to Genoa, the vessel’s homeport for year-round Mediterranean cruises.